Whenever I mentioned to someone that I would be traveling to Prague they told me it would soon become one of my favorite places. And they certainly were correct. 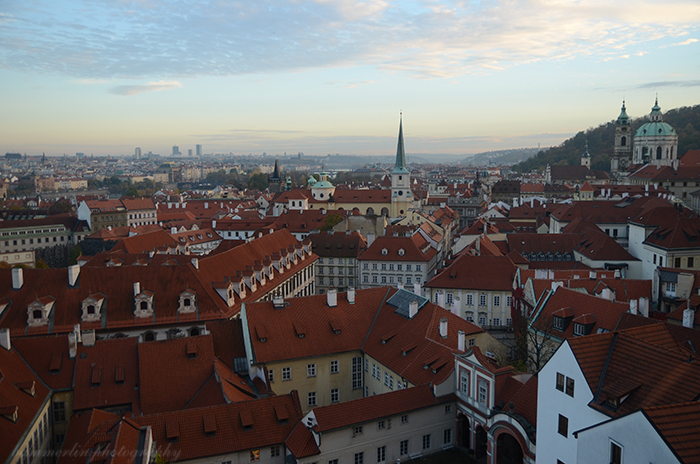 Out of all the new cities I visited on my month long trip, Prague was my absolute favorite. It was one of the most beautiful cities to photograph. The history, the architecture, the colors; it was simply stunning. 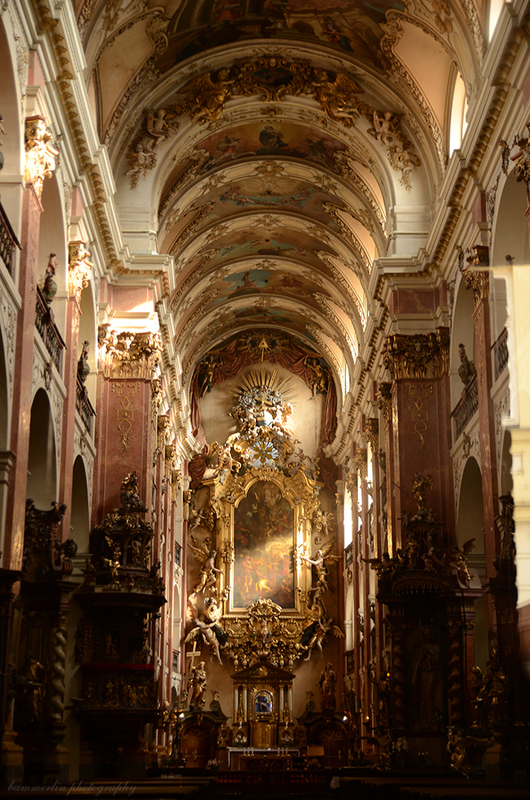 We arrived in Prague by train from Vienna, then took a cab to the place we’d be staying for two short days. We rented an entire apartment through AirBnB for only $65 a night, such a bargain! 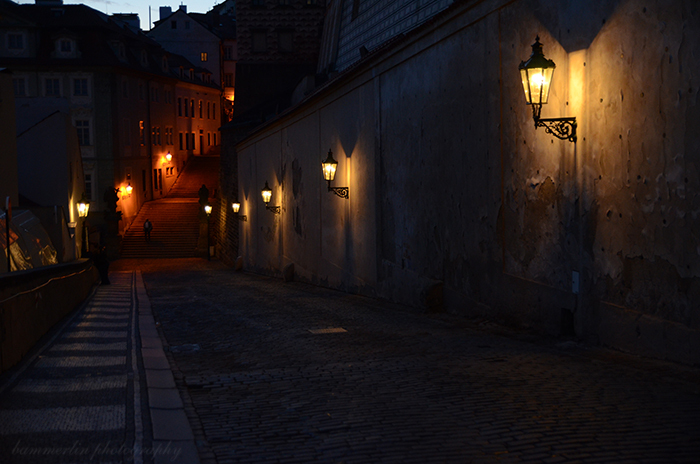 It was in a wonderful location on Nerudova Street which links the Prague Castle to Charles Bridge. It’s lined with various restaurants and shops, many of them touristy, but it’s still an enjoyable walk. Peeking out our window you could even see a bit of the castle rising above the buildings! After getting settled into our new place we headed up the street towards the castle. From there you can see one of the most beautiful sights in the city in my opinion: the red rooftops. Atop the hill where the castle sits you can look out onto a sea of gorgeous red rooftops. 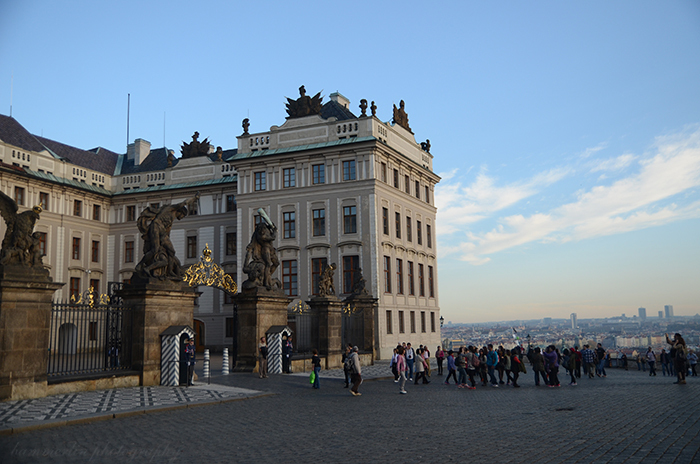 It’s my favorite view in all of Prague and only gets better as you walk around the castle gardens. Be sure to head for the little overlook in the gardens for some great photos! 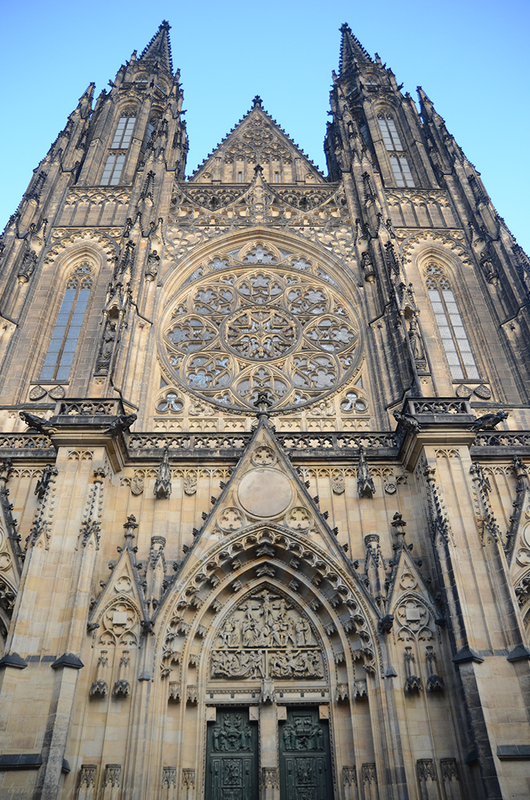 Prague Castle is considered the largest ancient castle in the world. 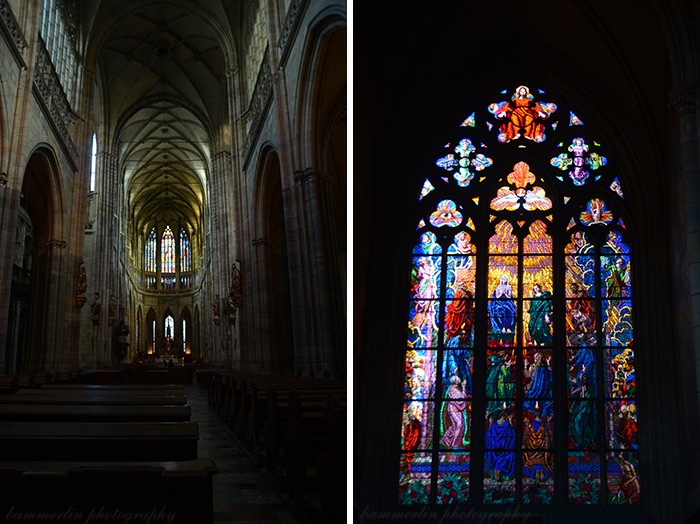 We didn’t have a chance to explore much of the castle, but we did visit the St. Vitus Cathedral, a gorgeous example of Gothic architecture and a must see. The stained glass, some of the most vibrant and colorful I have ever seen, casts an ethereal glow against the stone walls. There is no entrance fee, but you do have to pay to see some parts to the cathedral. Also inside the castle grounds, we visited Golden Lane, named for the numerous goldsmiths that used to live in the homes. The colorfully painted houses along the lane date back to the sixteenth century and now contain souvenir shops as well as a museum. There is a fee to enter the street, but we waited until after 6pm when it was free, however many of the buildings are closed at that time. That evening we decided to stop into one of the restaurants along our street, it had a cute little outdoor courtyard with heaters and blankets at each seat. I had heard much about trying the fried cheese in Prague, so of course I couldn’t pass that up! My meal was quite good, but it was the dessert, warm apple strudel, that was absolutely delicious. We even managed to meet a traveler at dinner who was also from Ohio, such a small world! To walk off all that fried cheese we ate, we made our way to Charles Bridge. It was commissioned in the fourteenth century and is lined with copies of numerous Baroque statues, the originals now at the National Museum. I highly suggest seeing the bridge both during the day and at night, it has such a different atmosphere. I loved seeing the city, especially the castle lit up against the sky. The bridge has almost an eerie, but beautiful feeling to it at night. With it’s dimly lit statues towering over you it’s as if you’re transported to another time. During the day there are a great deal street sellers, which can be unfortunate if you’re trying to experience the beauty of the bridge, but sometimes you can find a gem in all of the clutter. 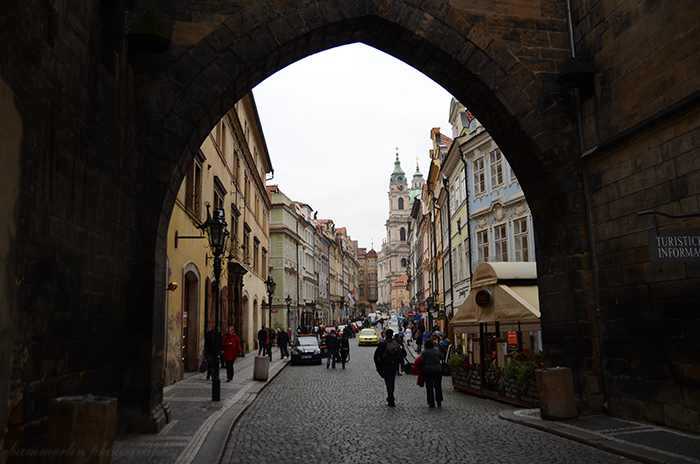 For our second and last day in Prague we took a free walking tour (tips are highly encouraged) which started in the Old Town square and went throughout the city. It didn’t require any prior sign ups, you can just walk up and ask to join. There were only four of us on the tour, making it very relaxed. It was quite informative and I’m glad we decided to do it. The above photo was taken on the tour through a glass window into the Basilica of St. James, which unfortunately was closed when we visited. Our guide had us peek inside and to the right where you could see something hanging from the ceiling: a severed arm. (Sadly, I didn’t manage to get a photo of it.) The story is that a thief came in to steal pearls from the neck of the Madonna, but just as he reached for the necklace the statue came to life, grabbing his arm and unwilling to let go. So the next morning they found him and instead of cutting off the arm of the Madonna, they cut off his arm. It has hung in the Basilica ever since as a warning for others. 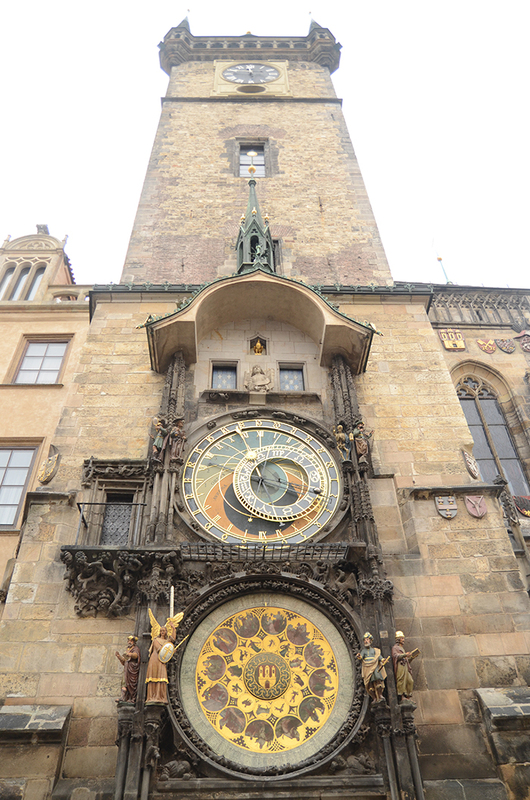 A must see in the Old Town in the Astronomical Clock. It was constructed in 1410 and still working today. As well as the time, the clock tells the current zodiac sign, the time of sunset, the saints of the day and more. It has been considered one of Europe’s most disappointing attractions, but I loved it. Groups of people gather around the clock, waiting for the hour to strike and for the twelve apostles to appear as well as various other figures. It only lasts about thirty seconds, which is why many consider it disappointing. But hey it’s a fifteenth century clock, it’s pretty impressive either way! 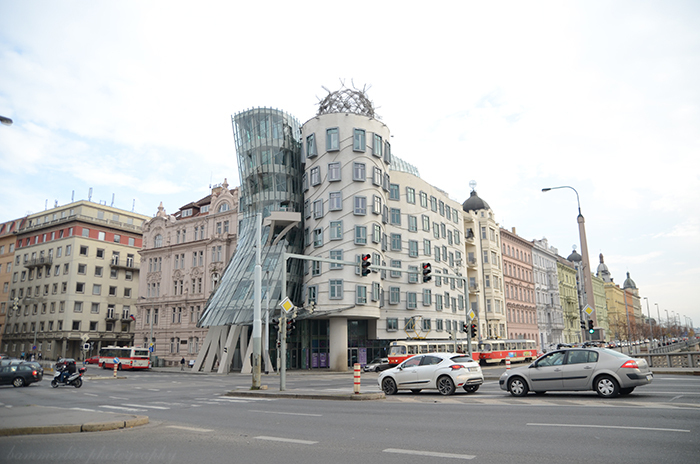 We only really ventured into the New Town for one reason, to see The Dancing House (also known as Fred and Ginger) by Vlado Milunić and Frank Gehry. I had studied the building while I was in school so it was definitely on my must see list. It’s a building that would stand out anywhere, but next to the eighteenth and nineteenth century buildings surrounding it, it’s a contrast of sharp lines and glass. While I’m not usually the biggest fan of modern architecture, there’s something about The Dancing House that I just love, maybe it’s that it truly does look as if it’s dancing against the skyline. 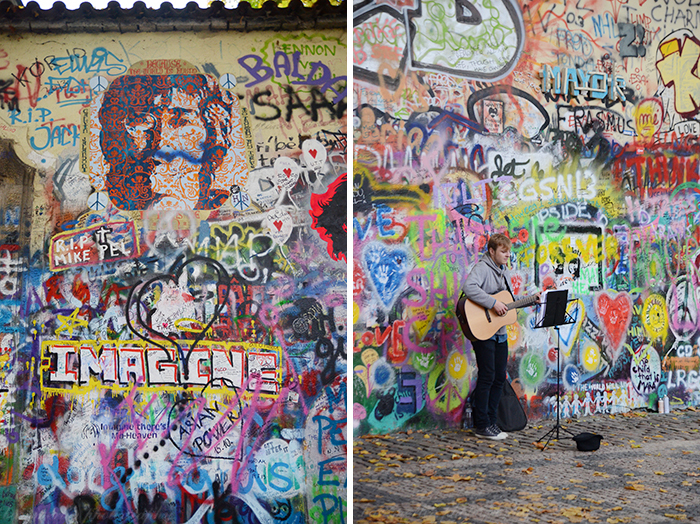 The Lennon Wall was also on our list of must sees. Despite the fact that John Lennon never visited Prague, people have been filling the wall with sayings of love and peace since his death. Layer over layer of graffiti has accumulated to become the colorful wall they have now. It’s become a great place for musicians to perform, playing a mix of Beatles songs to original music. Prague is a very walkable city and it’s easy to explore all of it’s best sights. It’s truly one of the most beautiful cities I have ever visited, seeming to transport you to another time unlike anywhere else. I hope that if you find yourself traveling through Europe in the future that you make a stop in the “city of a hundred spires”. I’m sure it will quickly become one of your favorite cities, just as it did for me. I hope you’ve enjoyed the first of my City Spotlight series. I plan on making this a regular series about the cities I’ve been fortunate enough to visit, as well as some I hope to travel to in the future! I hope you get to visit soon, it’s such a beautiful place!